Someone on my upcoming Alaska cruise on Radiance of the Seas said that RC told them that Radiance does not have little hair dryers in the drawer in the stateroom like other ships. I have been on many RC ships and they have always had hair dryers. Just wondering if this is accurate and is there anyone who has been on Radiance recently. Thanks for your help. I don't want to pack anything extra. I just noticed an age restriction on the info page about the Radiance suite lounge. Will my kids not be allowed in for the continental breakfast or does this just apply to the evening cocktail hour? They love the windjammer but sometimes it’s nice to avoid the crowd if you just want a croissant. Also, I’m curious if you can grab water or other drinks during the day in this lounge. Thanks! Are there Freestyle Coke Machines on Radiance? Are children allowed to use the solarium pool while this ship is in AK for designated times ? In Australia/New Zealand there were no children allowed at all but I seem to remember while in AK there were certain time periods allowed. Thanks for your help. Hi all! 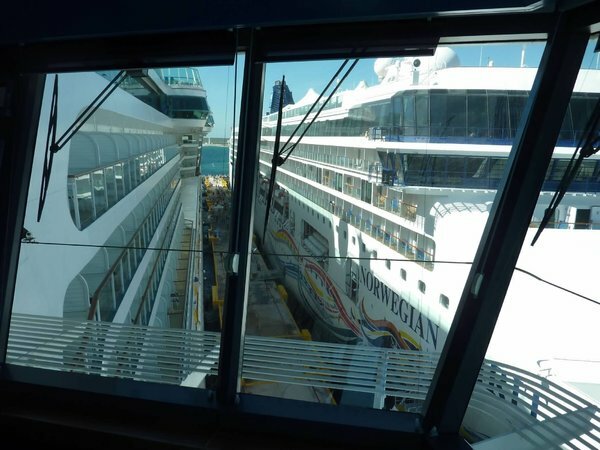 We’re considering a balcony stateroom for the May 2020 Hawaii sailing, and I see many photos online showing a divider curtain in the room. Do any of you know if they’re still there? We’ve rigged curtains around our little guy’s crib before but would be very glad to not have to pack the curtains and magnet hooks! Thanks! Are there USB outlets in the Radiance Cabins? Are there USB outlets in the Radiance Oceanview Cabins? Chef's Table on Radiance dress code? We're doing our first Alaska cruise on the Radiance next month. We are thinking of trying the Chef's Table, which would also be a first for us. I know in general Alaska cruises are more casual, even on formal nights, but wondering if Chef's Table has a stricter dress code. DH would prefer not to pack his suit, so would a dressy collared shirt and tie be enough? Also, while I'm asking, has anyone done the Chef's Table and is it worth it? I noticed on the RCCL Radiance of the Seas web page the Concierge Lounge is being referred to as the Suite Lounge. The quote on the page is: "TOP SHELF PRIVILEGES - It’s serenity with a twist of lime. Reserved exclusively for guests of Grand Suite-level accommodations and above, the Suite Lounge presents complimentary continental breakfast and evening drinks. So from croissants to Cosmos, we’ve got your cravings covered. Insider Tip For Grand Suite-level accommodations and above." Does anyone know if the change has been made from Concierge to Suite? Just wondering. We'll be on Radiance of the Seas this summer in Alaska. I'm wondering if there is anything on Radiance like the Vintages small wine bar on Liberty of the Seas. It's on the Promenade deck 5 and is somewhat cozy with limited seating (<20) and some small comfortable seating outside the entrance. I see on Radiance the English Pub but looking at pictures, it is a much larger affair than Vintages. I also see a Champagne Bar (seats 52) but nothing cozy and warm like the Vintages on Liberty. Can anyone set me straight? Radiance Dry Dock October, 2020? I just noticed Radiance will be arriving in Singapore on 9/30/20, but the next scheduled cruise is not until 11/4/20 Singapore to Australia. I am guessing that 9/30 to 11/3 Will be Dry Dock time. Does anyone have any information concerning this? When reading about The Radiance - several things are mentioned in the "Things to Do" section -but I don't see them in the cruise planner so I an purchase. Specifically - Murder Mystery Dinner, Jewlery Making and Scrapbooking. Some of the others are there - and I bought them like Cupcake Class, Sushi Class etc. Is this typical? When do these things show up usually? Thanks! Radiance of the Seas Upgrade 2020? With some of the best features from other Royal Caribbean ships, Radiance offers plenty of diversity while maintaining an intimate vibe afforded by its modest size. (Note: An extensive upgrade is scheduled for 2020.) Has anyone else got info on this? What will the upgrade include? If it's true and a descent upgrade it would work out perfectly as I'm considering doing the B2B that goes all the way around Australia in 2021 for my 40th birthday. It would be my 5th cruise with Royal, 2nd time solo, 1st B2B and first time on Radiance. My first cruise was on Rhapsody of the Seas - is Radiance similar? Thanks and happy cruising. Any preferred suite locations on Radiance? I’m currently on the Radiance as we make our way back to Sydney following a planned port intensive itinerary around New Zealand. Alas, it wasn’t to be due to major storms in the South Island. Our 12 night itinerary now includes five sea days when all is said and done. If anyone has questions about the Radiance experience, I’ll be happy to try to answer. One can only attend so many movies on sea days when it’s rainy, windy and chilly outside. Some passengers are a bit grumpy but all decisions by the captain were made for safety first. I completely agree with him but missing the South Island Fjordlands was a major disappointment as I flew 17 hours nonstop from the US to Sydney to cruise this ship and this itinerary. Kinda like going to Alaska and not seeing the glaciers. Shout out all! Looks like a larger balcony. Just booked coming back from Hawaii. Is this a good cabin for coastal viewing, anyone love or hate it? Thank you for any feedback. I know you can buy Voom daily basis, just wondering if you can buy allotment of minutes e.g. 60, 120 minutes package for internet like you can on Princess? Does the Concierge Lounge on Radiance have an outside seating area? We really enjoyed this feature while cruising on Serenade and hope that Radiance has a similar configuration. No Family Harbor on Radiance? Was just looking at the deck plans for Radiance. Appears they are doing away with Family Harbor on this one, though it does seem to exist on the Panorama. Wonder why the change so soon, and if that means we should not expect one on Mardi Gras either.